Many Americans wonder how terrorist attacks like the Fort Hood massacre and the Boston Marathon bombing could have happened. In these cases the military and FBI failed to follow up on clear indicators, and even warnings, of radicalization. The media, pundits and political leaders portrayed the attackers as an anomaly, the actions of lone individuals. The term "lone wolf" is commonly used by law enforcement and public officials when talking about "home grown" terrorist attacks. The implication is there is no larger movement or ideology involved. Officials want Americans to move on, because there is nothing to see here. This narrative is both a false and dangerous. There is one document that proves this narrative is false. 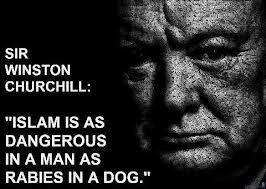 The document shows how these, and any future attacks, are not the actions of lone wolves. Rather this document shows that Major Nidal Hassan and the Tsarnaev brothers were in fact "Soldiers of Allah" and acted in full compliance with the Islamist movement in America. They were acting not as individuals but as militant members of the "ummah" (the Muslim community). The document is a 81-page manual found in a Mosque Bookstore, Brooklyn, NY written by an Islamic leader and filled with racist comments about American law enforcement, Jews, non Muslims, etc. It is a hate filled manual. The manual tells Muslims how to go underground if they are wanted by U.S. law enforcement for terrorist crimes or other violent crimes. The manual is titled "What should you do if you are arrested or investigated by the racist, fascist and criminal police, or the racist, fascist FBI?" and, according to the title page is written by Dr. al-Hajj Idris Muhammad. The judicial and prison systems are to be increasingly defined as instruments for unbridled repression, racism, and genocide. We must continue to resist and organize, and Allah, the Creator will bless us with victory and paradise. You don't have to talk to the racist, fascist, criminal police, or the racist, fascist, criminal FBI, or any other racist, fascist, criminal law enforcement or investigators. If you discover that the racist, fascist, criminal police or racist, fascist, criminal FBI Agents are searching for you, for the alleged murder or wounding of a racist, fascist, criminal police officer, or a racist, fascist, criminal FBI agent, you should go underground and eventually leave the country. The racist, fascist, corrupt Caucasian Jew controlled media functions as a propaganda organ, of the state, coloring political prisoners of war as criminals, when in fact they are valiant Revolutionary Soldiers fighting on behalf of oppressed people. Deal openly and honestly with the differences within your masjid [Mosque] or organization [Islamic cultural center] before the racist, fascist, criminal coward, pervert, homosexual FBI and the racist, fascist criminal coward, pervert, homosexual, police exploit the situation. Never speak with the racist, fascist, criminal FBI or the racist, fascist, criminal police. Never allow them in your home without a warrant. 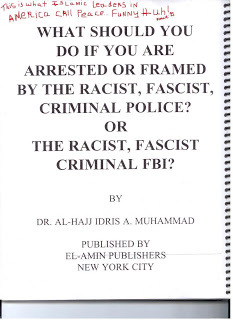 "Another booklet that is distributed in mosques of the United States is entitled 'What should you do if you are arrested or investigated by the racist, fascist and criminal police, or the racist, fascist FBI?' This guidebook is written  according to what is printed on the title page  by Dr. al-Hajj Idris Muhammad, and is issued by the publishing house 'al-Amin' in New York. "In this booklet the writer instructs the reader in how to withstand interrogation relating to his religion and jihad against the 'Great Satan,' by exploiting the rights of freedom of speech and freedom of expression. These rights are considered the most important rights in the United States, even if by exercising them, the United States is rendered less able to fight the enemies who conduct their jihad against it from within and from its prisons." "[E]xposes how the FBI has, under the guise of engaging in counterterrorism since 9/11, built a network of more than 15,000 informants whose primary purpose is to infiltrate Muslim communities to create and facilitate phony terrorist plots so that the Bureau can then claim it is winning the war on terror." Phony terrorist plots eerily sounds like recent claims of phony scandals surrounding Benghazi and Extortion 17. The whole idea is to make the Muslim community distrustful of law enforcement agencies, while at the same time insulating people like Nidal Hassan and the the the Tsarnaev brothers from scrutiny. The intent is clear: prevent law enforcement officials from doing their jobs and lull Americans into a false sense of security. Reading this document will open the your eyes. It is more frightening when you understand this type manual is in many mosques in America. I have obtained several copies of this manual if you want one please contact me: davegaubatz@gmail.com. This manual is a must for CT Researchers and American Patriots who want real evidence to show your local law enforcement, politicians, and media. Dave obtained several copies of this manual from a mosque bookstore in Brooklyn, NY. The manual is filled with racist comments, hatred, and informs Muslims how to go underground if they are wanted by law enforcement for terrorism or other crimes in America. I suggest you obtain this manual and then show to your local authorities. Evidence like this makes more of an impact than having a hundred protestors hold banners against Islam.